Creating a shrine was not a difficult requirement for me as I’ve been making altars for a few years. The challenge, however, was making an altar in accordance with a hearth culture and within a Druidic framework. Having started on a Pagan path through Wicca, I was used to having certain articles on my altar. When I realized that Wicca was not the path for me, I abandoned some of the traditional tools, such as the athame, and turned my altar into a mishmash of significance. It was only through the deep introspection and study of mythology encouraged by ADF that I was able to build a shrine that was truly important to me and symbolic of my faith. When I first started to think about putting together an altar for ADF, I knew it would have to be different from my past altars. It would require space for offering bowls, something I’d never dealt with before. My altars used to be built on top of slender bookshelves. After moving into a new apartment, I decided to use an old vanity that I was not using. My altar is in the kitchen, the hearth of my home, near the stove. 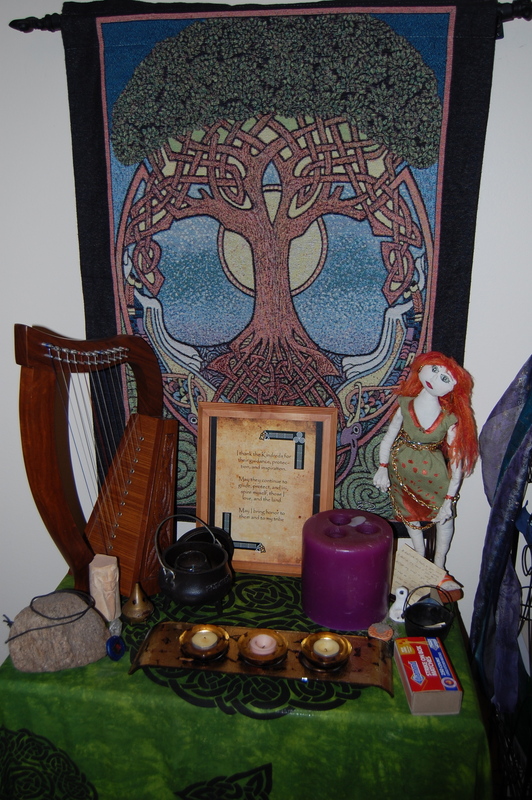 In the very center of my altar is a representation of the Bile, the world tree. It is a wand I made from an apple branch, wire, and silver bells, similar to the wand given to Cormac in Irish mythology. To the right of the tree is a doll/statue I made to represent Brighid. Below her is a dish with a candle so that I can keep her flame once every month. To the Bile’s left is a large stone representing An Dagda. I found the stone during a hike I dedicated to him. Atop the stone is a ring of black twine that is also significant from that hike. Behind the stone is a lap harp I bought at an Irish Festival. It always reminds me of An Dagda and his harp of seasons. Perhaps I will learn to play it one day and I will be able to incorporate it into my rituals! There is also a representation of the fire and the well on my altar in the form of a candle and a cauldron. Towards the front of the altar are three small bowls containing tea lights that represent the three Kindreds. The center candle represents the Gods while the right candle represents the ancestors and the left represents the nature spirits. In addition to these there is a fourth bowl on the altar into which offerings are given. There are also a few small incense holders. Everything sits atop a beautiful green altar cloth with black Celtic knots swirling over its surface. On the wall above my altar are photos of some of my ancestors and a candle that I can light when I want to specifically pay homage to them. I think the photos serve as poignant reminders of my ancestors and enable me to really connect with them spiritually and emotionally. All of the items on my altar are significant because they represent something spiritually important whether it’s symbolic of a deity, spirit, or simply the connection I have to the other world or my hearth culture. Seeing these symbols reconnects me and mentally prepares me for the rituals and mediations held before the altar. I don’t feel that my altar is complete. There are many improvements that I would like to make to it. To begin with, I would like to locate more photos of ancestors to put on my wall. I would also like to find better storage compartments for underneath the altar. Currently all of my candles are in a cardboard box and everything else is in baskets just sitting there, vulnerable to my two curious cats and all of the fur they shed. I also look forward to the day when I have a larger home and will have room to expand my altar. Perhaps I will move it from the kitchen area to the living room to make it more central and accessible to larger worship. Ideally, it would have its own room one day, complete with prayer mats, a library of Pagan-related books, and soundproof walls for meditation. One can dream, right? I have enjoyed creating my Druidic altar. It has become such a significant focal point in my spiritual life. Never before did I interact with an altar on a daily basis. Never before was an altar so important to me. The altar is not only a shrine to the Kindreds, but a peaceful sanctuary for me. My altar as of March 2010. 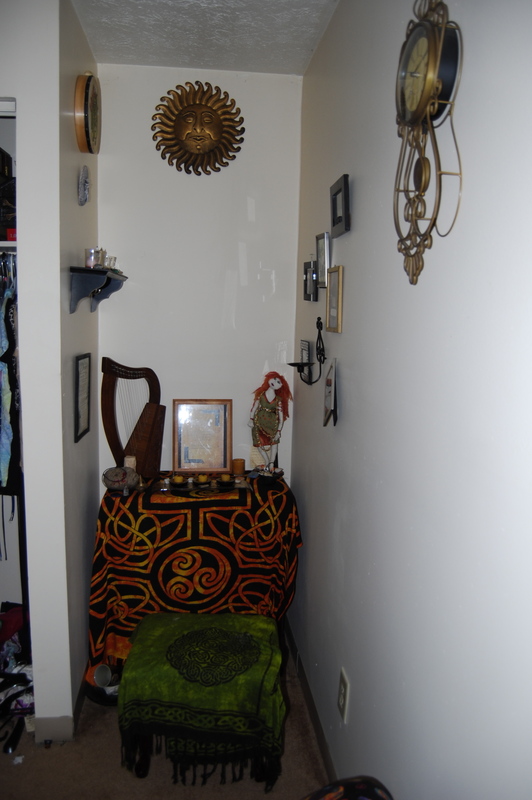 I moved my altar in the autumn of 2010. Here it is incomplete.